It’s been a long time I haven’t visited and tasted the foods in Melbourne. Believe it or not, it’s nearly 18 years until my hubby and I made a trip to Melbourne and drove to Adelaide last two weeks. My hubby's major interest was sight-seeing, mine was eating of course. Our original plan was to walk around and explore Melbourne’s CBD for two days, then drove farer districts to try the word-of-mouth foods, that were recommended by friends, not featured in any circulated travel magazines in hands. Here are some highlights of our tasting-around trip. It might not be doing the justice to all the cuisines in Melbourne and Adelaide, but in such a short post, I have only selected some yummy foods that I guess people might overlook. The first cuisine we tasted was Italian as an array of quality Italian restaurants in Melbourne awaiting for visitors to enjoy. We went to a very little corner shop, located in Carlton. They have only a dozen of seats. When we arrived, the little shop was packed with customers, so we were seated outside. Feeling the chilled and windy night was not a pleasant experience. We’re glad that we could move in after a table of customers were gone. Pollo Fungi Pasta (diced chicken, sliced mushrooms with parmesan cheese in creamy sauce). How could we miss the Cantonese Chinese food? Absolutely not. A friend directed us to Wonton House (正斗雲吞). Springy shrimps were wrapped in slippery wonton wrappers. 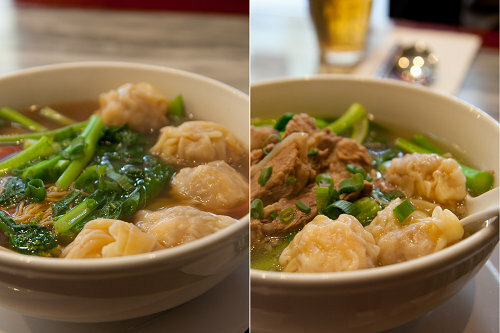 Wonton soup is my all time favourite snack. Oh, breakfast is very important to us. Apart from enjoying buffet breakfast at hotel, or simple, continental one, I loved this special, giant German sausage bread tasted in Victoria market. Many Australian people are fascinated by the decoration on top of cupcakes. We are not just satisfied with the look, but also looking for some quality cupcakes with good taste. 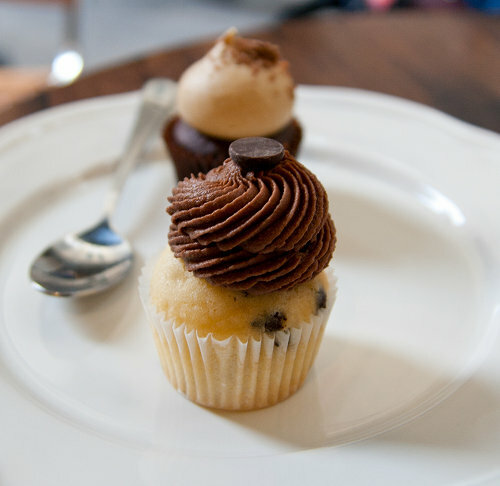 On Degraves Street, there's a cupcake specialty shop. We tasted their mini cupcakes. Actually, they have standard size of cupcakes but we only tried two different flavours of their mini size, mocha and chocolate chips, with modern decorations on top as well as rich chocolate flavours. When we stayed in Adelaide, we mostly enjoyed those street snacks in the market. 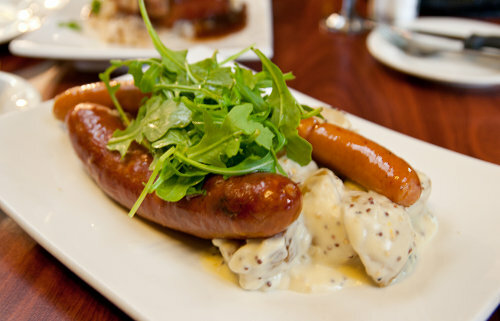 The one I should mention is The Hahndorf Inn Hotel - award-winning restaurant that offers a variety of German foods. It took us 30 minutes to drive from Adelaide to Hahndorf. I don’t eat pork hock actually, but this time I was keen to drive a long way to sample their signature dishes that recommended by my friends. When we stepped into the restaurants, the well-packed restaurant said all to us. Very curiously, we found several tables were seated Chinese customers. I guess the pork hock is more appealing to Chinese than Western people. Am I right? Before I left, the lady, I think the boss of the restaurant, told me they are opening another branch in China. Their chef was to fly there the day after. 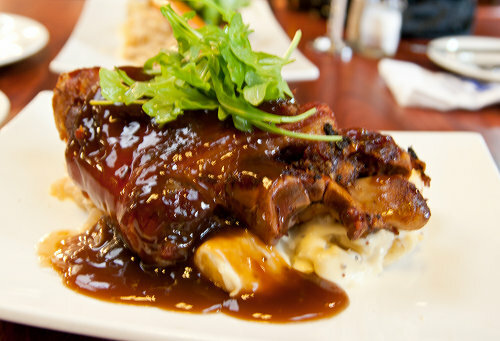 Giant Juicy Pickled Pork Hock – the succulent pork meat literally fell off the bone. but love the sausages more. I forgot to take a photo of the sausages after cutting open. There’s creamy cheese running through inside. 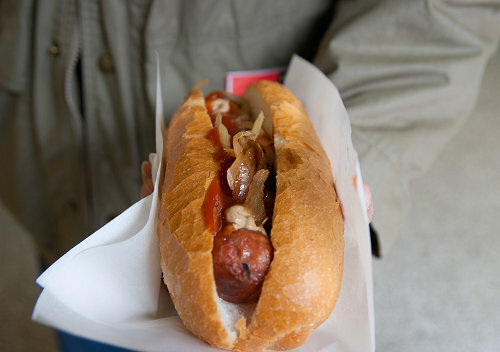 The texture of the sausages was really smooth. Thanks for all my loyal readers to view this post and shared the joy of our eating-outs in this trip. I’ll keep posting recipes shortly on this blog. Hahndorf!!!! Memories of my childhood! Hahndorf Inn has the best food in Hahndorf, I reckon. Did you try 'Chocolates at No. 5'? They have great iced chocolates and Bee Sting Cake too. It's in Hahndorf too. As for Melbourne, did you visit Lygon Street? 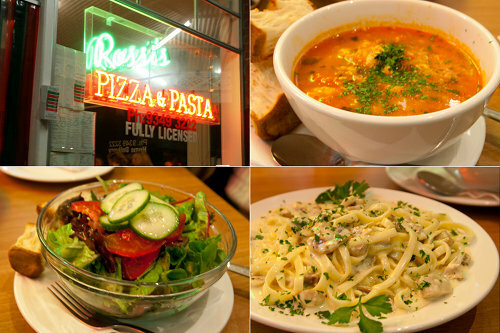 They have a lot of great food there including a famous Il Freddo Gelato Store. Sounds like you had a lot of fun, I'm happy for you! 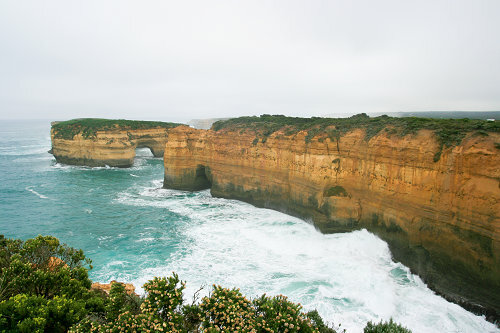 Christine, Melbourne is on my wish list of travel destinations! It looks like a place for foodies. Wonton House 正斗雲吞? I'm wondering if it is the same as the one we have here, which is also known for its congee and rice roll noodles. If you'd like to explore a few more wonton experts, I'm sure you know which direction to fly next time : ). 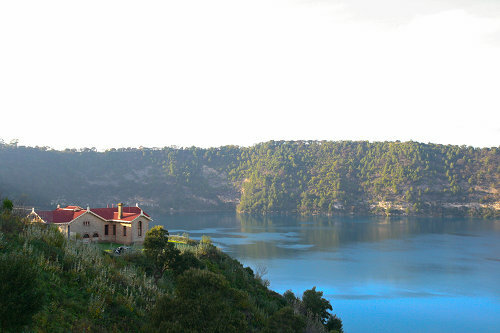 Beautiful sceneries and delicious food! I hope to visit Melbourne one day. I have always wanted to visit. Hope it's sooner. Sounds like you had a fun trip with delicious food! I hope next time my husband goes to Melbourne he takes me with him! I would love to walk alongside these cliffs! I had one of the best scallops when I was in Melbourne. It was too long ago..I forgot the name...but it was along the streets...some stopover/vista points along Great Ocean Rd? I can't remember. The scalllops were just deep-fried in batter like fish and chips but because the scallops were fresh, they were very good! I love these wontons! A beautiful place that I want to visit too! Two thumbs up to the foods and I would love to have a picture at that cliffs.